During 2012, in a series of Saturday classes, Brother Brian Dybowski introduced students to Saint Thomas Aquinas, providing an understanding of his great contributions to civilization, including development of the discipline of philosophy, still unsurpassed today. Pope Leo XIII, in his Encyclical of 1879 called Aeterni Patris: on the Restoration of Christian Philosophy, wrote: “We exhort you, venerable brethren, in all earnestness to restore the golden wisdom of St. Thomas, and to spread it far and wide for the defense and beauty of the Catholic faith, for the good of society, and for the advantage of all the sciences.” From St. Thomas Aquinas Class Summary #5: Thomas fit speculation and revelation together into unified knowledge, the Thomistic Synthesis. It is an integral whole, each part mutually enlightening each other part. 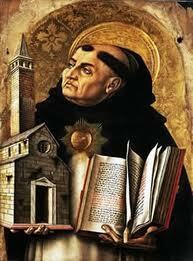 Thomas was a theologian on his knees, a contemplative whose prayer-life infused his writings. When asked how he learned all this, Thomas acknowledged: “at the foot of the cross”. Thomas did not share his prayer with us, but he did share the results of his prayer in his writings, both philosophical (commentaries on Aristotle’s books), and theological (commentaries on Scripture, and his summaries of conclusions from revealed truths). See below for a complete list of class notes and the link to the full document. From St. Thomas Aquinas Class Summary #6: Once Thomas recognized that the core of Aristotle’s synthesis, the integrating point, was Pure Act, he realized that everything in that synthesis relates to that point. All changes are variations of act overcoming the limits of not-yet. All parts of the synthesis reinforce each other by interacting. Thomas saw the same dynamic in revelation. From Abraham through the prophets God leads His people through a mass of confusing events… These accounts of faith-development through covenants with God puzzle us until Christ “explains the Scriptures”, Lk 24:27; 24:32, 24;45. 21. Why did Powerful Authorities of His Time Oppose Thomas?